Bean Around Town: Full Moon, Baby. I am one of those wavy gravies who believe in the powers of the changing moon cycles. I'm not always exactly sure how or why the moon seems to affect me, I just feel that it does. For instance, yesterday I felt very drained and exhausted and today I feel refreshed and energetic. I did some projects and house cleaning that I have not felt motivated to do, nor felt I had the time to do, for weeks. I feel optimistic and positive about my goals and intentions. I am also slightly more driven and demanding today. 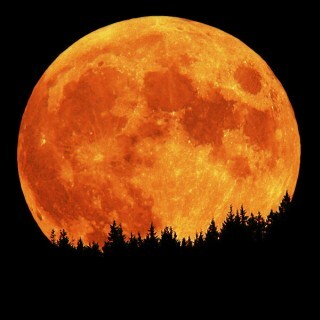 As a health care worker, I have long suspected that the full moon intensifies moods and emotions. Many of my busiest shifts in long term care facilities were on full moon evenings. Ask any nurse or care aid to attest to this phenomenon. It got so that as a casual employee, I would often turn down shifts if I knew they would fall on a full moon, because I knew they would be about five times busier than a regular shift. I also am feeling a sense of completion today because of the decade anniversary of 9/11 and the returning of the kidnapped boy from Sparwood, B.C, Keinan Hebert. I allowed myself to become emotionally invested in the case, which was a dangerous thing for me to do, knowing that most of these cases do not turn out well for the abducted child. I felt so positive and encouraged by the response of people online and felt that there was a collective power at work to get that child home safely to his parents. Now, I realize that we were all at the mercy of the person who abducted the child, allegedly one Randal Hopley, and his decision to return the boy could only have come from within. Did he hear the pleas of the parents, or the public? Or was it something bigger? All I know is that there are many questions left unanswered and no matter where he hides, at some point, the kidnapper will have to atone for his actions, whether here on earth or somewhere else. On a lighter note, I pulled out my loom yesterday and I have begun knitting my cowl. I am very pleased with my progress thus far and am enjoying the ease and quick sense of accomplishment it is giving me so far. The weather is unseasonably warm, but I know that could change at any moment, so might as well get a jump on it.